So John Scalzi finds himself needing a more professional website—plus he has this writing gig, you know, novels and stories and events and other little things like that, so he doesn’t have time to tinker with a website. 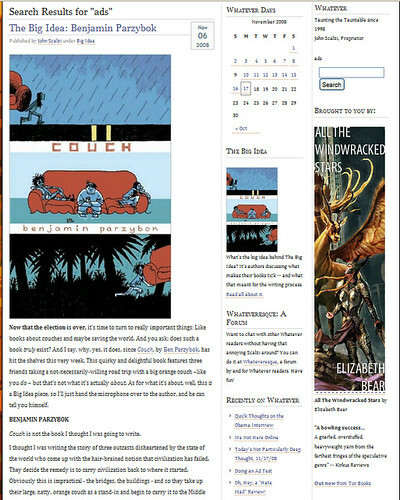 And since I like reading his books and stories and, heck, his blog, I and pretty much everybody else in the Whatever audience support ads coming on Whatever, so long as they’re un-obtrusive, relevant, and are good-looking static images with maybe a little text. The money from the ads will go to hiring a skilled web designer/WordPress guru. Good deal all around. Currently he has a test ad on his blog, and I think it looks alright—it’s off to the side, and it’s relevant, and it’s pretty, and it’s a static image with a little text under it. I’m putting the rest of this under a cut, due to the images. I think this is pretty good. And of course it’s All the Windwracked Stars by Elizabeth Bear, so it’s extra good. By the way, if this looks strange on LiveJournal, this is because LiveJournal is put together from bubblegum and Popsicle sticks, and you should click through to the real blog.